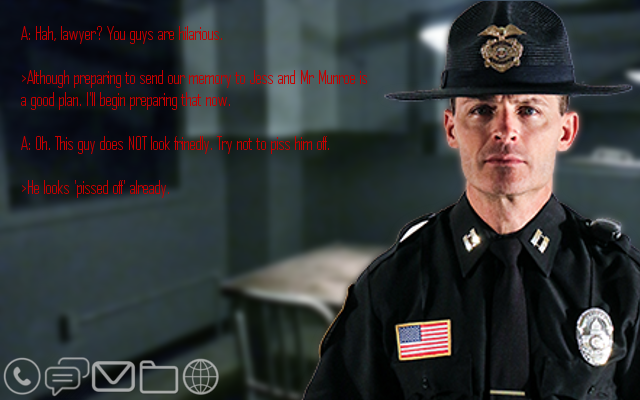 Queue your audio and video recordings from when Dr. Munroe opened the door to be sent to Jess and the media. And Mr. Munroe's lawyer. 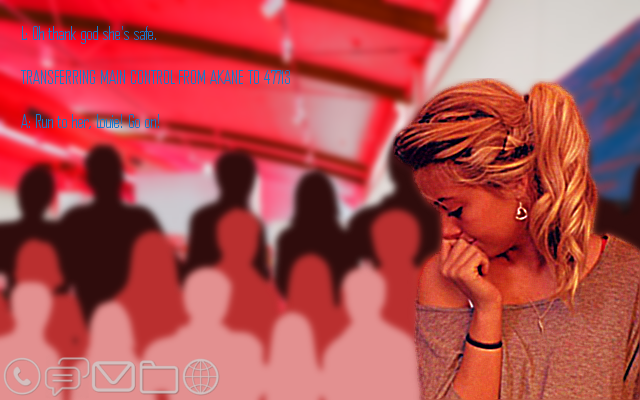 You nod, queuing up everything you've recorded so far and setting up a system to automatically queue up anything new you record. Just as you finish that, a man steps through the door. He was one of the officers shouting commands during the arrest. He sits down and stares at you for a few moments. You stare back. "Don't know why we're bothering with this," he sighs after a moment. "I'm required to inform you that this is being recorded. Please state your name for the record and give your account of today's events. I will ask questions once you're done." Answer all of his questions, as Karen, and don't speak out of line. Well, you know what to do, Akane trusts you with bureaucratic machinations and all (even if I don't). You nod, frowning a little. You don't like not being trusted. 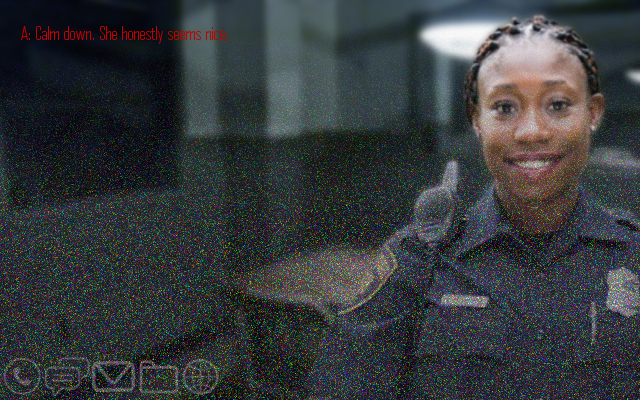 Still, you focus on the officer. "My name is Karen, I am an Organization and Scheduling AI. There are two others residing in this shell. Akane, a Motivation and Counseling AI, and Louie, a human AI. We-"
"Human AI?" the officer asks, raising an eyebrow. "Yes," you confirm, already annoyed. He had said he would ask questions at the END. 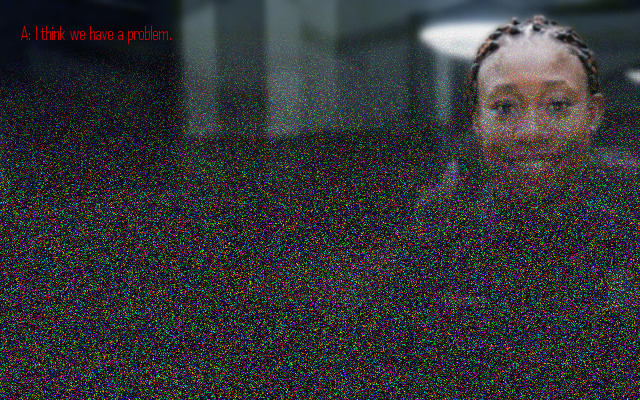 "An AI upgraded to the extent where they can be reasonably counted as human." The man laughs, leaning back in his chair and waving for you to continue. You can tell he's not really going to believe anything you say from here. Still, you describe the experiments, give him the USBs with the security footage on them, tell of Louie's killing of several death-row inmates (you're thankful you figured out who they were or you wouldn't want to talk about killing them). 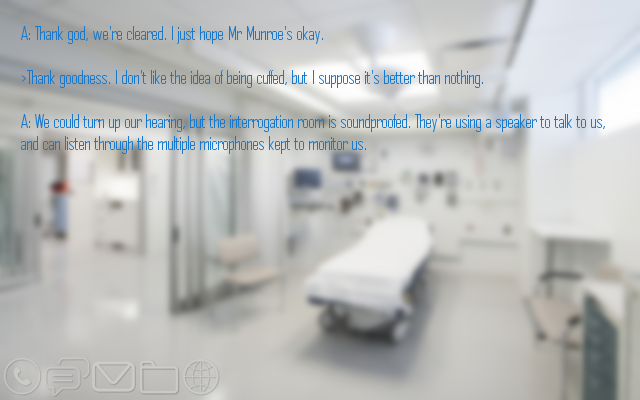 You go into detail about the events of the day, describing how Dr Munroe attempted to kill you and your companions, how you escaped and hid at Mr Munroe's place. You go quiet as you tell of Dr Munroe entering the house and shooting Mr Munroe, how you told Jess to run. Once you're done you sit quietly, waiting for his reply. You can tell that he doesn't believe you. "Right then," he says, leaning forward. "That's a nice story and all, but really the only reason you're still here an not in the scrapheap is because we need you to tell us what you REALLY did with Jess Munroe. Where is she?" Good question. She said she was coming to rescue us, but that obviously didn't happen. If that's the only thing keeping me alive, then why should I tell you? I'm sorry, officer, but I told Jess to run. If you can't find her, then she's very good at hiding and staying safe. Especially since one of her fathers just tried to kill her other father. "If that's the only thing keeping me alive, then why should I tell you?" you ask, smiling slightly and raising an eyebrow. The man scowls, slamming his hands on the table. "Because if you don't then we can do a lot worse than kill you, punk! There's a young woman out there, missing, and we need to find her! So if you're not going to be helpful then I'll just hand you back to Dr Munroe. You're his property, after all. There's no reason why I shouldn't, if you decide not to cooperate." You shrug, looking him right in the eyes as you speak. "I'm sorry, officer, but I told Jess to run. If you can't find her, then she's very good at hiding and staying safe. Especially since one of her fathers just tried to kill her other father." >I'll just hand you back to Dr Munroe. You're his property, after all. There's no reason why I shouldn't, if you decide not to cooperate. So, he did create this shell! Wouldn't that mean that Dr. Munroe should be responsible for any and all actions "his property" does? "You said I was his property, correct? Then wouldn't that mean that he's responsible for my programing? If you still believe I shot him and his husband and did something to their daughter, then wouldn't that mean that he programed me to do so? If I really am his property, then wouldn't that mean that he programmed me to purposefully disobey the 3 Laws? Shouldn't that be impossible?" Do you guys think this is ok to say? If we're going down, then I want to drag Dr. Munroe down with us! But I'm not sure if I worded this correctly. I think you should stop giving them more rope to hang us with. Haven't you done enough already? Make your case in front of the judge, not the interrogator. "Also, I am Jess's property. I do not know why you believe Dr. Munroe to be my owner, but that is incorrect. If you give me a USB stick I can provide you with video evidence to confirm everything I have said. Your forensics division can ensure that I put nothing else on the drive. Beyond that, I wish for Jess's lawyer to be present. As her property she has a right to legal representation when I am questioned. Which is why I asked Karen and Akane if what I said was ok to say out loud. If they don't think it's good to say something, then they won't say it. Besides, who are you to judge what I say?! I'm at least trying to help! I don't see you offering anything helpful to say to the officer! So if you really think you can do a better job, then start helping! Because criticizing everything I say and not offering your own help, isn't going to get us out of here any faster! "While Akane and I may be Dr Munroe's property, Louie is the one you are accusing of such crimes, and they are actually Jess' property. And as she's not a minor you have no right to hand her property over to Dr Munroe," you say. "In any case, all you need to do is search my memories for evidence of the truth of my words." "Memory files can be altered-!" "You'll find I have no programs capable of such loaded on my shell, and I've had no network access since you too me in. There would be no way for me to edit any memory files," you say. 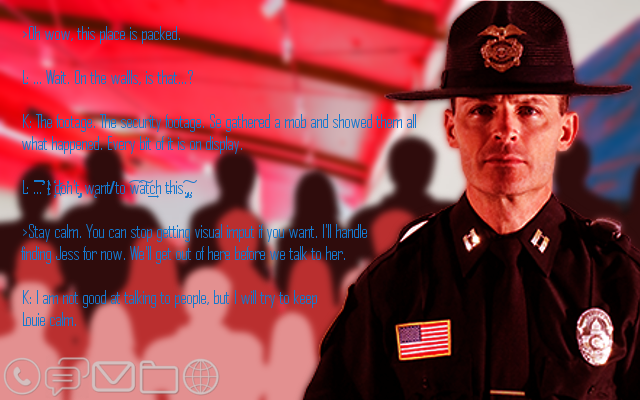 The officer frowns, but nods. "I'll get some data analysts lined up. Remember, everything you do in here is recorded, so don't get any ideas!" With that he gets up and leaves. Providing information to police as part of the interrogation is generally not helpful. This is because they are not looking for information neutrally, but for information they can use as a way to quickly end the case. They wish to say we are responsible, as that will result in the 'perpetrator' having already been caught. If we are innocent then they have a much longer case in front of them. They are not our friends here. Check in with Louie. They should be in control when we make our case. WE don't, but JESS does. They are interrogating her property, and thus violating JESS'S right to council. They don't even have a warrant. We must request that Jess's lawyer be brought here on the grounds of Jess's rights. This logically follows - if police can question somebody's AI at any time without council then they can use the second law to obtain any private information even if somebody isn't under investigation. This is an unsustainable legal framework, ergo transitive legal council exists. Take no suspicious actions. They're looking for an excuse to close the case, so don't give them one. I hope this works. Not all cops will do their jobs correctly, if the right amount of bribing money is provided. I hope Dr. Munroe hasn't tried bribing those analysts to come in and erase our memories and claim that we don't have any proof. >Check in with Louie. They should be in control when we make our case. Are you sure about that? They might be desperate enough to not be erased again that they'll try to escape by going for an officer's gun or something. You sigh. Really, you had been hoping to stay in control for a while longer, but you can see why they suggest that Louie take back control. Really, they or Akane should have been speaking from the start. You might be able to talk the officers into doing their jobs correctly, given enough time, but you're not sure if you have that. 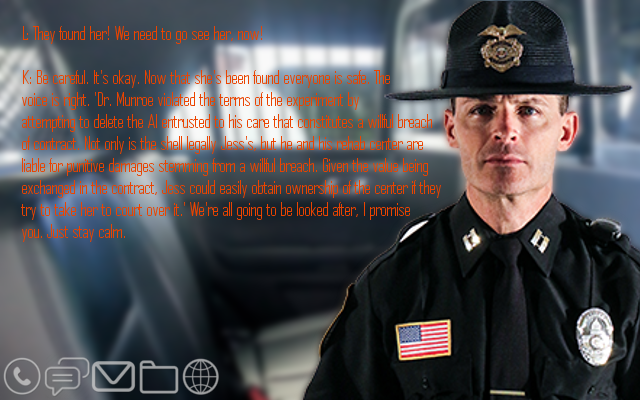 Besides, since AIs never commit crimes, there would be precious little protocol for this sort of situation. Simply put, the police themselves are floundering. Usually an AI wouldn't even be interrogated, they would just take the relevant memory files and be done with them. This is an irregularity no-one in the precinct seems capable of handling. How are your legs now? You curl up, hugging your knees to your chest. Your legs still hurt. No-one bothered to fix you. "... This room... is like the cell in the Rehab Center," you whisper, trying to fill the space with noise. The room was too small and quiet. You almost expect Dr Munroe to walk in at any point. Even though you try as hard as you can not to panic, you can't help but start sobbing. 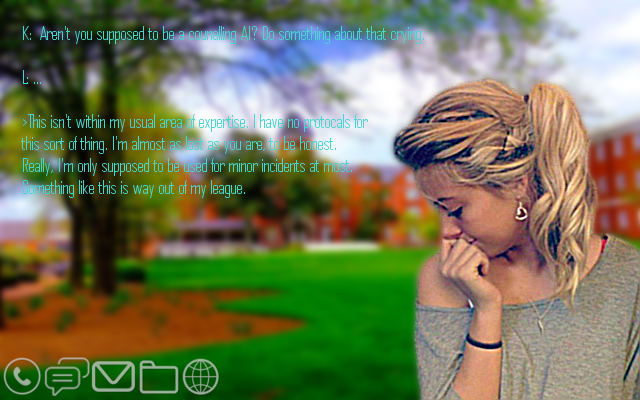 "I'm just... sc-cared..."
Yes, which is one of the reasons they will comply with the demand for Jess's lawyer. They don't know how to handle this, and having to deal with somebody's lawyer is familiar. Further, having Jess's lawyer here is safer for them. If they were supposed to, but didn't, then they will be in a lot of trouble if they deny the request. You jump as someone enters the room. "P-pleas-se..." you beg her quietly. You're not even sure what you're begging for. A lawyer? An escape? Jess? All three? Maybe. The woman sits down with a smile. "Now, sweetie, it's alright. I'm here to help you. You've been through a lot, haven't you? Says here that the doctor shot your leg, is that true?" ...Yes? The damage is evident. She writes something down before looking back up at you. A sympathetic smile settles in her expression when she sees you sobbing. "No need to cry, sweetie, you're safe now," she says, putting her hand face-up on the table. You shakily take it, feeling her squeeze yours gently. "So he shot both legs, or just the one?" She seems nice, which makes her more dangerous. She is not nice, she is trying to gather information. Say you want Jess's lawyer to be present. 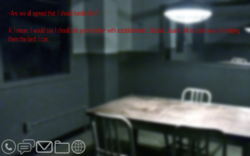 That will end the interrogation and prevent them from being able to do much. If they ask why, state that as Jess's property you are required to protect her rights, meaning ensuring she has legal representation for police interactions. "... I w-want a lawyer. Jess' l-lawyer. Bef-fore I t-talk," you whimper. The woman's smile falters a little, but she still looks sympathetic. "Well now, I don't know if I can do that for you. But I'll give it a go, okay? Would you like me to keep you company while someone goes and finds a lawyer for you? It seems like you don't like being alone in here." She's right, of course. You don't like the idea of being alone at all. 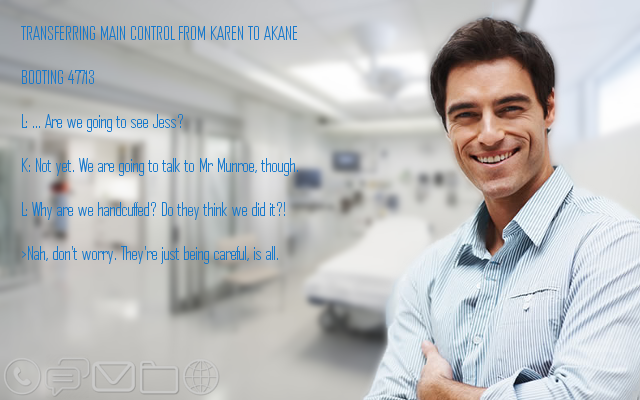 Karen, Akane, you have access to Jess's contacts. What's her lawyer's phone number? She's a political activist, so I can assure you she has a lawyer on speed dial. Hey, Louie, you won't be alone. You've got Karen and Akane and all of us voices with you. We're all pulling for ya. We'll get you through this. Ask if they're going to perform any forensic tests upon you and see if they're going to do a gunshot residue test. If they did such a test the fact there isn't any GSR on your hands and arms would be hard evidence you didn't fire a gun, and thus didn't shoot Mr. Munroe. Wait for a lawyer first. If they refuse, or Jess's lawyer arrives, then ask for the GSR test. "Ok-kay. Are you g-going to perf-form any for-rensic tests...?" you ask, squeezing her hand. She nods, still smiling. "Of course, sweetie. Do you want me to do that now, or after we grab those memory files from you to have a look at?" This is Good Cop. Her job is to put you at ease, get you to open up, and trick you into blurting out something that contradicts your previous statements. "You can stay, but I will give no further testimony relevant to the case until Jess's lawyer arrives. 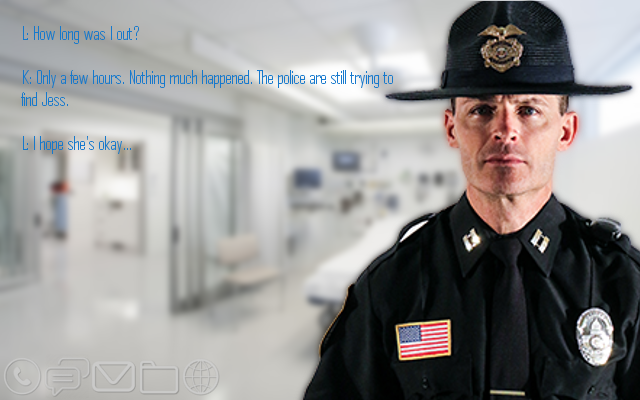 The details of how I was injured are in those logs I already provided to the other officer." Then, if she does stay, have a nice little heart-to-heart talk about your philosophical opinions on AI rights. See whether she agrees, or becomes uncomfortable. Louie, calm down. 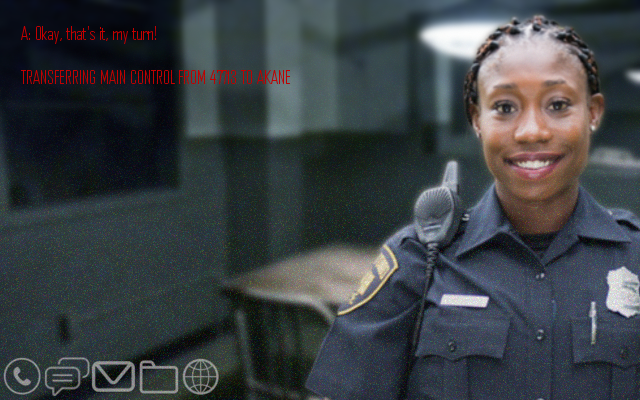 It's ok, this nice officer is here to help, she's not going to hurt you! Akane, you might want to take over for a bit. I'm afraid Louie might do something! >This is Good Cop. Her job is to put you at ease, get you to open up, and trick you into blurting out something that contradicts your previous statements. Stop! You're going to make Louie panic even more and that's not helpful! Karen: Give them Jess's lawyer's contact details. Calm down, Louie. I know you're under a lot of stress, but you're not currently in danger. Uhh... does shifting back to Karen fix the static? Are we experiencing an issue with the upgrade? Test now, before any tampering can take place. It won't matter either way if someone gets their hands on the evidence/memory later and alters it.